RISE Properties announced today that preservation has been completed so they are listing the 6,278 sq. ft. home for sale. The home features four levels of living space with six bedrooms and four and half bathrooms that have all been meticulously refurbished and modernized. The home plan is named after Anna Ellicott, one of Seattle’s early pioneers, whose land donation contributed to the formation of Fort Lawton in 1900. Located at 4012 Washington Avenue West (in Discovery Park), the Ellicott is sited upon a .39-acre lot overlooking the historic Parade Grounds with a massive wraparound covered veranda offering unobstructed views of the Olympic Mountain range and Puget Sound, just as it has for more than a century. “The Ellicott is one of the Grand Dames of Fort Lawton and it presents a truly unique opportunity to own legacy real estate in Seattle,” said Gary Blakeslee, Vice President of Rise Properties. Blakeslee believes all eleven remaining homes will be fully renovated and sold this year. Four out of the six homes on the south side have already been sold. 4012 Washington Avenue is the first Ellicott to be listed for sale. The north side has seven homes of which two are nearly completed and three will be completed in late November and December (two out of the seven are now delayed by the fire damage). Originally built in 1904, the Ellicott was a former residence for many of the military’s most senior officers until Fort Lawton was closed in 1973. Much of what was once Fort Lawton was donated to the City of Seattle and became Discovery Park – a 534-acre sanctuary just fifteen minutes from downtown Seattle. The 6,278 sf. of living space has been thoughtfully renovated by the world-class design team of Seattle based GGLO. 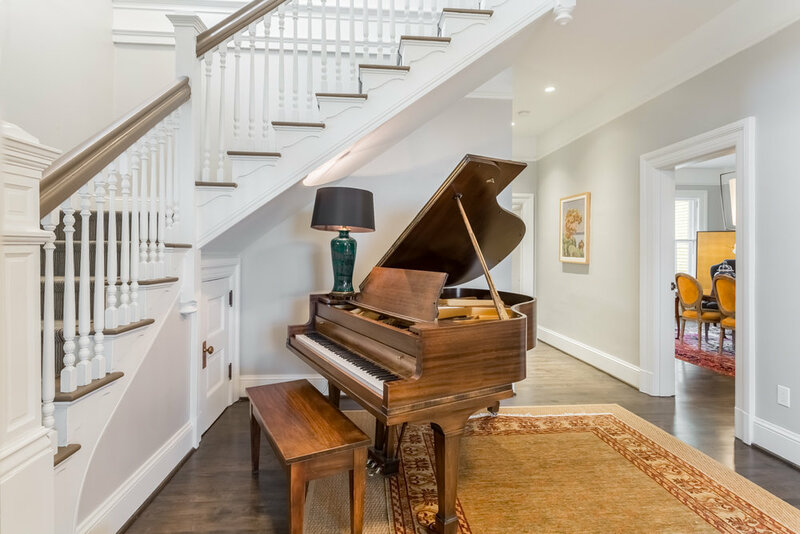 This expert team of architects and interior designers worked with the City Landmarks Preservation Board to ensure that the home’s unique historic attributes are preserved while incorporating contemporary, modern-day conveniences. The home includes all-new plumbing with on-demand hot water, new electrical systems, hydronic in-floor heating on the main floor and electric heated marble floors in the bathrooms, while energy efficient low-profile radiators heat the other rooms. The new homeowners will enjoy a completely transformed kitchen with generously-scaled gathering space including a breakfast parlor, executive-quality Miele appliances, a wine fridge, gas cooking, and two ovens. GGLO also reprioritized living spaces on the upper level to create two master bedrooms with spa-like bathrooms and fireplaces. A fully-finished, spacious daylight basement has exposed stone walls and brickwork that provide the backdrop for an airy feel, with views of the water from the west facing room. The laundry room doubles as a crafts space. While a fourth story provides a huge open loft for a media room, bedroom suite or private home office. Oversize windows fill the home with light while a picture postcard front terrace takes you back in time with territorial views that are distinctly Fort Lawton. The proud Colonial Revival architecture harkens back to other US treasures such as Monticello and Mount Vernon, and is the defining design element of the Fort Lawton Historic District. The preserved homes qualify for a property tax credit for the next ten years, which means owners can save thousands of dollars per year. While this district remains a protected national landmark, RISE was able to add two car garages for each home on Officer’s Row. GGLO also designed exclusive common areas offering residents access to a shared pea-patch, children’s playgrounds and a neighborhood fire pit for community gatherings. The Ellicott is the latest offering in what’s been an extraordinary sales program at Fort Lawton. In 2015, RISE began restoration and quickly sold all thirteen homes that comprise Montana Circle. Earlier this year several Prosch plans, a 4,000 sq. ft. version of Officer’s Row homes were also sold and closed. An open house is being hosted this weekend from 11am to 5pm. Prospective homebuyers are encouraged to reserve an appointment time by registering online at www.OwnFortLawton.com.